The O2 Arena is the most popular events arena in the world, and hosts approximately 1.5 million visitors per year. 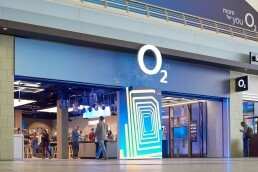 As well as sponsorship of the Arena, O2 also has a unique retail location situated in the main entrance foyer. 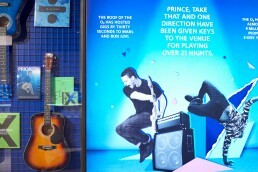 With this level of footfall O2 wanted to show off the brand, and create a real experience store based around its close associations with sport and music. Working closely with the retail team we proposed a store design that includes brand heritage space, extended accessories display, an interactive Priority fixture, a fully functioning performance stage as well as the usual product range and Guru demonstrations. Removing the existing shopfront also allowed us to bring the store experience out into the foyer with an LED totem wrapping the structural column. 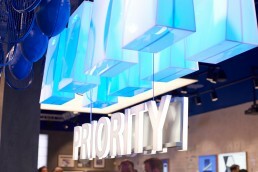 The new store hosts many events from the latest tech demos, product give aways and even live gigs on the rear stage area - bringing to life the world of O2 in a fun and engaging way.